We have a few of them in stock, and they add a touch of fun to your home or bar, as well as being a useful and practical addition to your furniture. 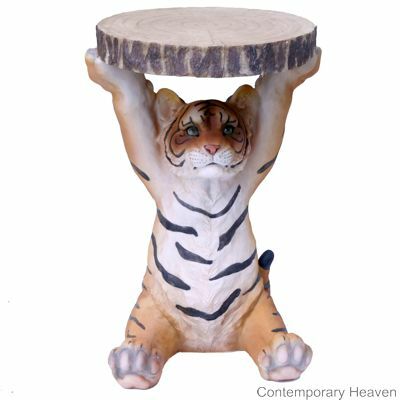 This colourful Tiger is more cute than ferocious, and at 52cm high is the perfect height for an end table. Sitting down with his front legs raised and holding a slice of tree trunk, he’ll put a smile on your face every time you see him. This cutie is quite realistic, with the polyresin material giving lots of detail to the fur. We see this as an inspired addition to a bar or man-cave, and we’re sure you will too. If you go down to the woods today…you can enjoy your own picnic on this adorable teddy bear table. Finished in gloss white it is fun, original, and useful too. We all love teddies don’t we, so whether it’s for the child in you or for your children, we don’t mind. We love this little fella, he’s charming and beautifully coloured too. Like the Tiger and Black Bear mentioned previously, he stands 52cm high and holds a slice of tree trunk between his front paws. We have seen these animal side tables at lots of different prices online, and we are sure we’re the lowest. Take a look and see what you think too. If you find one cheaper let us know.